I am pleased to advise that the First Bus timetables for the 27, 22, 50/51 services will be remaining virtually unchanged through the winter. No. 22, Truro to St Austell via Probus and the Clay Country. No change from Summer 2015 timetable, except that the 06:10 Probus Square to Truro Bus Station journey on Monday to Friday is withdrawn due to negligible passenger numbers. No. 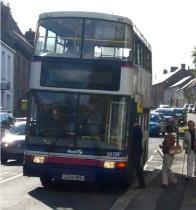 27, Truro to St Austell and Bodmin via Probus and Grampound. The 17:45 from St Austell and the 18:35 from Truro Bus Station journeys on Monday to Saturday will not divert via Grampound Road. Alternative facilities are provided by route 22. Timetables are available from the Buses page.